Our core investments within the healthcare sector are organized in Holta Life Sciences AS. The company was established in 2014 as a fully owned subsidiary. We believe the healthcare sector has very favourable long-term fundamentals. In our view, the pace of innovation and success rates in development are set to rise based on a better understanding of molecular- and human biology and improved research tools. We invest in product companies at all stages of development. Our main focus areas are diagnostics, medical equipment and therapeutics. Gentian Diagnostics is a medical diagnostics company listed on Merkur Market, Oslo Stock Exchange. The company is headquartered in Moss, Norway, with a representative office in China and distribution subsidiaries in Sweden and USA. Gentian’s ambition is to innovate diagnostic efficiency by designing, developing and marketing in vitro diagnostic tests. The goal is to offer efficient and accurate reagents within the areas of kidney disease, cardiac disease, inflammation and veterinary medicine. The NanosenseTM technology will enable users to move assays from low volume immunology platforms to fully automated, high throughput instruments with shorter turnaround times, better workflow and improved cost efficiency. Sales revenue in 2017 was MNOK 35. 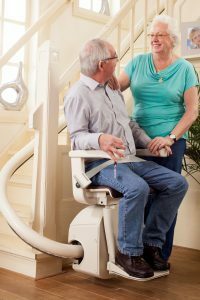 The offering encompasses a comprehensive range of straight and curved stairlifts, transfer, lifting and repositioning aids, vehicle accessibility products and solutions and medical equipment. Approximately 70 percent of sales are for care in the home, "Homecare" and the remainder for hospitals and institutions, "Institutional". Handicare is a global company with sales in more than 20 countries and is a market leader in this field. The head office is in Stockholm, Sweden and manufacturing and assembly are located at six sites distributed across North America, Asia and Europe. Sales revenue in 2017 was MEUR 284.